Johnson’s Arkansas Mississippi and Louisiana. 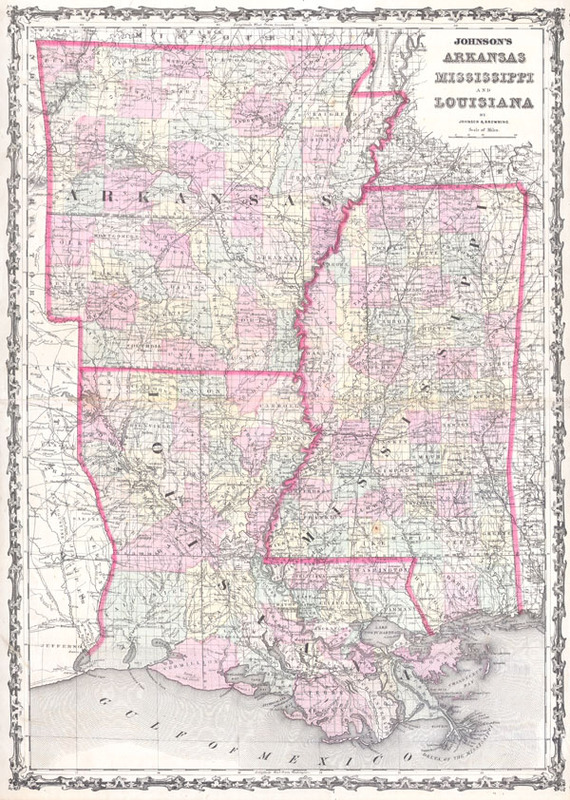 This is Johnson and Browning's 1861 map of Louisiana, Arkansas and Mississippi. Covers the states divided into counties with special attention to transportation, especially roads, railroads, and canals. Offers wonderful detail around New Orleans and the Mississippi Delta. Features the ribbon style border common to Johnson's atlas work from 1860 to 1862. Steel plate engraving prepared by A. J. Johnson for publication as plates no. 37 and 38 in the 1861 edition of his New Illustrated Atlas… This is the last edition of the Johnson's Atlas to bear the Johnson & Browning imprint. Johnson's New Illustrated (Steel Plate) Family Atlas, (1861 Johnson and Browning edition). Very good condition. Minor repairs to margins and reinforcement of original fold. Very light discoloration on centerfold. Blank on verso. Rumsey 2905.020 (1860 edition). Phillips (Atlases) 6140.31-32 (1860 editon).